It came so suddenly. It was like that partially melted spatter that spits out of the machine as soon as you pull the lever for the self-serve frozen yogurt. Bali’s Yogurt, the original self-serve frozen yogurt shop in San Luis Obispo, shut down their machines, covered the windows of thier Higuera Street storefront in plastic, and put a white piece of paper on the front door. 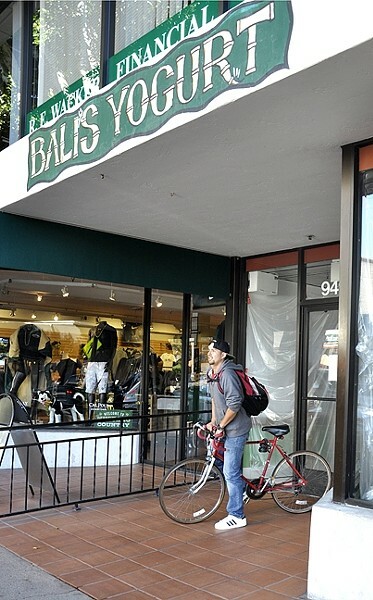 NOT HAPPY : After reading the sign announcing that longtime self serve frozen yogurt shop Bali’s Yogurt had closed, Diego Contreras looked directly across the street, where Yogurtland recently opened in downtown SLO. “I will never go there,” he said. The owners of Bali’s Yogurt and a longtime employee all declined to comment for this article. The yogurt shop closed its Foothill Boulevard location earlier this year after vacating to make way for a major overhaul of the University Square shopping center. Bali’s was a pioneer in the local world of self-serve frozen yogurt. Before its arrival, froyo customers were bound by limited options, unable to access the yogurt machines themselves. Bali’s brought a new vision, one with no counters between the customer and the yogurt machine. At Bali’s, customers could experience the liberating joy of filling their own styrofoam cup with whatever, however they chose to do it, before that incredibly satisfying moment when they placed their own cup on the weigh scales. Then everyone else started doing it. Several other self-serve frozen yogurt shops popped up downtown. Most recently, Yogurtland—one of the largest froyo chains in the nation—opened directly across the street from Bali’s, becoming the fourth of its kind operating within a few downtown blocks. Then, just two weeks after the signs spread through town, Bali’s posted their own sign. The Internet buzzed with locals mourning the loss of a San Luis Obispo original, heaving a collective sigh of shock, anger, and disbelief at the surprise announcement. Even though many of the frozen yogurt shops throughout SLO County are locally owned or locally franchised, dedicated locavores are loyal to Bali’s. Elegies on SLO’s recent loss are posted on social media sites like Facebook and Reddit. People walking by the empty storefront on Oct. 22, stopped to read the small sign placed on the door. Local resident Diego Contreras said he was disappointed that a shop he grew up with is no longer, and he lamented the spread of chain stores in downtown SLO. According to San Luis Obispo County Assessor’s records, the property is owned by Jamestown Premier SLORental Limited Partnership. That company, an Atlanta, Ga., based real estate investment firm commonly called Jamestown Properties, bought several holdings from the prominent downtown property owner Copeland’s Properties in 2013. It’s not clear what will fill the void suddenly left by Bali’s. Will the new space be filled with an expensive women’s clothing boutique? A yoga studio? Another Which Wich? Or, perhaps, another frozen yogurt shop?